How does Blackstar make such an amazing sounding amp in such a small package? I’ve already done a review of sorts on the Blackstar HT-5 head in my Now this is what I call a Tiny Terror! BlackStar HT-5 head review post. I’ve now brought the HT-5 head home for good, and thought it was now time for a full review. Looking at the amplifier from an aesthetic perspective, it is a nicely understated design. Black leather-like material with black corner protectors, and black leather handle. It looks and feels tough enough to endure the rigors of getting carted around. The only real downside is the chrome knobs. The marker is also chrome, making it hard to see what your dial is set to. While on the subject of downsides (there are very few with the HT-5 head), the supplied foot switch comes with a very short cable. I understand that this amp was designed to be used for practice and studio use, but when the foot switch barely reaches the ground in front of my 1×12″ cabinet it definitely seems kind of short. The casing of the foot switch does seem kind of dinky and small too. These issues are all minuscule once you warm up the tubes and hook up your guitar. 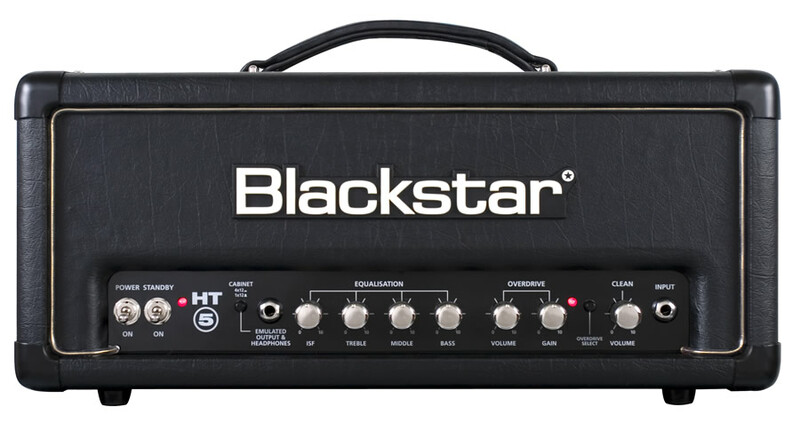 It seems that Blackstar have come up with a winning formula with the HT-5. Playing with the amp at extremely low volumes the HT-5 sounds a little muddy, but there is still a great tone there. It can easily be tightened up with the proprietary ISF knob. Turn the amp right up and it sounds like a huge 100 watt stack, without the insane volume. Don’t get me wrong though, the HT-5 is still quite loud. I believe if it were paired up with the right speaker combo it will be more than sufficient for gigging. The clean channel isn’t anything to write home about. It’s perfectly acceptable, without being really anything special. If you were wanting to play with the HT-5’s clean channel in a loud jam or small gig it probably wouldn’t cut it. 5watts doesn’t exactly lend itself to enough headroom for cleanliness. You can however get a nice clean-ish sound out of the dirty channel when winding back your guitar’s volume knob. I primarily play on the dirty channel so the clean channel is not a real issue for me. The dirty channel is where this amp really shines. There’s enough gain on tap to go from slight bluesy overdrive to fairly high gain metal tones. If there isn’t quite enough distortion for you throw an overdrive pedal in front of the amp and it becomes truly devastating. The ISF knob really does make a difference to the HT-5’s tone. Keep the knob in the first half of its range and you’ll have a more US flavoured mid-cut tone, and the second half brings in the classic British tone. I prefer a more woolly British sound from my amps, so I keep the ISF knob at about 3 o clock as I find it gives that classic Marshall-esque tone without getting too muddy. There is a shared 3 band EQ comprising of bass, mid, and treble, and whilst sharing these seems somewhat compromising, it really isn’t a problem dialling in your sound, clean or dirty. Starting with them at 12 o clock is probably the best place to start as it gets a pretty good tone straight out. I found that slight tweaks then brought out the exact tone I was after. Turning the gain to 3 o clock, and the ISF to the aforementioned 3 o clock, and I was getting a great tone with enough grind for music like Iron Maiden and Metallica, and I could wind back the guitar’s volume knob enough to get to an almost completely clean sound, and everything in between. The HT-5 takes quite well to pedals too. The classic Boss DS-1 Distortion pedal works fantastically in front of the amp as it gives a great electric Texas blues tone on the clean channel, and rips through the mix as a boost for the dirty channel. The HT-5 has a fairly high gain level, but the DS-1 sharpens it up for a great modern metal sound. Not buzz-saw sharp, just a great razor-sharp tone, retaining all the great qualities of the dirty channel. I hooked up my recently purchased Digitech Hardwire DL-8 Delay Looper pedal in the HT-5′s effects loop and the multitude of settings the DL-8 is capable of sound fantastic there. I wont go in to too much detail with the DL-8 as I’ll write a review on it soon. Blackstar have also provided a fantastic speaker emulator. Plug it in to your mixing desk/PA or computer and it provides great tones with the option to select either a 1×12 or 4×12 speaker emulations. They both sound great and are quite comparable to the real thing. I particularly love the speaker emulator as it enables me to plug it in to my computer, allowing me to crank up the amp for great tone, but provide me with a low volume when my son is asleep. It also saves you the hassle of finding the perfect mic placement when recording your guitar parts. In summary the Blackstar HT-5 is an amazing amp at a low price. The tones from it are huge, and the effects loop, gain levels, and speaker emulator really put it ahead of the low wattage small tube amp pack. If you play music that primarily uses a dirty channel, the HT-5 teamed up with the right speaker combo will serve you well for gigs, as well as studio and practice duties. I have also reviewed this on Jemsite’s comparison shopping. Go check it out for more reviews on this product, and prices at different online stores. 9 Responses to "Blackstar HT-5 head – a full review"
great review and thanks for taking the time to do so. Great first person review I really want one of these amps, I just have to ty it to sell me! Thanks for the review, very informative. I have a 2×12 yamaha ss STEREO Combo VR600 8 OHMS Yamahas answer to Roland JC 120. Very good quality jap speakers. How do i bypass pre and poweramp best? I just wanna use the combo like you: speakers for my HT-5. BS HT5 line out or speaker out? For really great lead & metal tones which is preferable? If you upgrade the preamp valve to something like a Tung Sol 12AX7 you will get significantly better distorted, and clean tones from the HT-5. That’s my recommendation. Best bang for buck with that upgrade. Good review on this great sounding amp. Hey, I wanted to share what I thought too. The Blackstar HT-5RH is a straight forward, easy to use tube amp that is perfectly suited to the guitarist who wants a great practice amp that is also suitable for jamming or recording. It is solidly built, looks fantastic and most importantly, it sounds amazing. There are not many (if any) other amps in this price range with the features of the HT-5RH. Other models lack some important home use features like MP3 in or headphone out…not crucial for jamming, but mandatory for late night practice in a busy home. The effects loop is a serious addition, which will appeal to more experienced guitarists. For this reason, I really think that the Blackstar HT-5RH is the best amp available in its class right now.